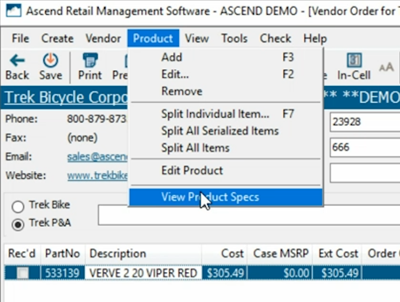 Ascend is integrated with Trek Bicycle, which makes it easy to check product availability in Ascend before you place an order. You can look at product data by categories in Order Grids or check individual product information in Product Specs. To view order grids, you need the user permission Integration - Trek Bike / Parts Grids. 1. 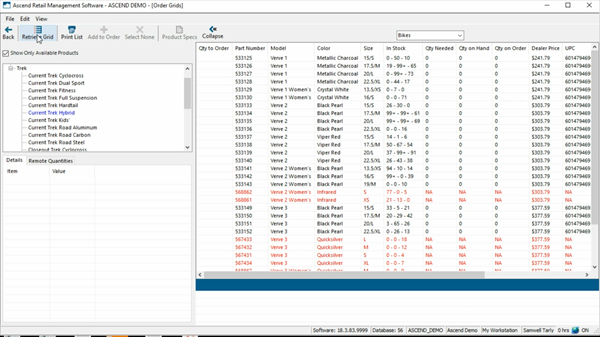 There are several ways to navigate to Order Grids in Ascend. a. Select the Order Grids tile on the Ascend desktop. b. Select Integration > Trek > Order Grids (Bikes or Parts & Accessories) on the Ascend desktop. c. Open or create a Vendor Order for Trek Bicycle Company. Select the Order Grid icon at the top of the vendor order. 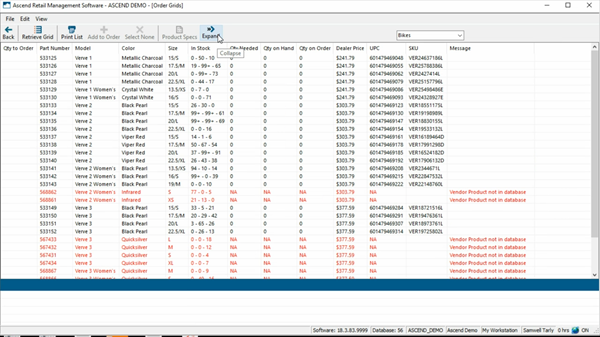 You can only add items directly to a purchase order from the Order Grids if you opened them from a Trek purchase order. The Order Grids screen opens. 2. You can view items by Bikes or Parts & Accessories. Use the drop-down on the top right to navigate between them. 3. Expand the categories on the left side of the screen. 4. Select the appropriate lowest-level category for the items you want to view. To save on load time, products will only display for the lowest level categories AKA a child category. 5. If needed, check the Show Only Available Products option to display only products that are currently in stock at Trek's warehouses. The items appear on the right side of the screen. 7. To get a better view of the results, you can select the Collapse icon to close the search section and expand the results section. The In Stock column is extremely useful - it pulls data directly from Dexter so you can see what quantities are available for each product at the various Trek warehouses. Next to In Stock is the Quantity Needed column, which lets you know if you have any items that need to be reordered (based on the Min and Max levels you have set). If an item is sold out or unavailable for any reason, you’ll notice the item appears in color and has a note in the Messages column stating what the issue is. You can double-click a product to edit the product record. 9. In the Qty to Order field, enter the amount you wish to order for the product. 10. Click on another product to accept the changes you made. 11. If you need to clear all entered quantities, click the Select None icon. 12. When you're done editing quantities, click the Add to Order icon. In the Order Grid, you can highlight a product and select the Product Specs icon to open a new window with the product’s details from Dexter, including an image when available. You can also access Product Specs by highlighting the product in a Trek order and selecting Product > View Product Specs. And you can do the same thing if you’re in a transaction - simply highlight a sales item and select Products > View Trek Product Specs. Or, if you’re on the Ascend desktop, select Integration > Trek > Product Specs. 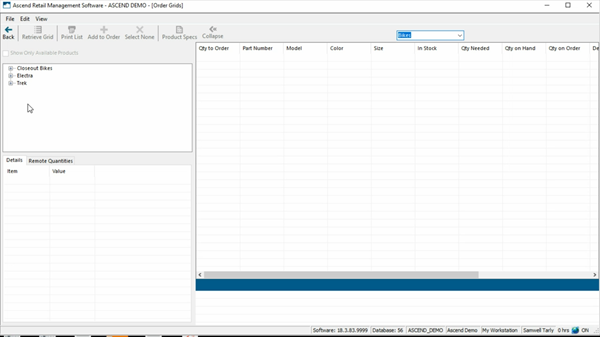 Then enter a Trek part number to view the product information from Dexter.